For the third straight year, the U.S. Agency for International Development increased its grant spending, with the amount awarded jumping from $9.79 billion in 2014 to $10.75 billion in 2015. This 9 percent growth coincides with a billion-dollar increase in USAID contract spending over the same period. 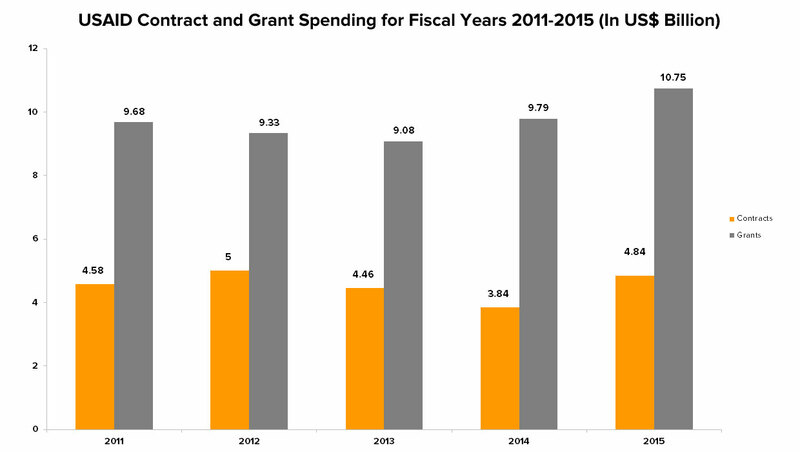 As expected, USAID grant spending remains significantly higher than its contract spending. Multilateral organizations such as the World Bank and the World Food Programme continue to receive major portions of USAID grant financing. In 2015, both organizations received more than a billion dollars in grants, far exceeding other grantees. Combined, the two organizations account for 22.64 percent of last year’s total obligated grant funding. Grants for other organizations under the United Nations umbrella reached a total of $954 million, with UNICEF ($410 million), the World Health Organization ($159 million) and the Food and Agriculture Organization ($136 million) receiving significantly larger sums than other U.N. affiliates. Other notable multilateral grantees include the International Organization for Migration ($210 million) and the Gavi Alliance ($200 million). Meanwhile, cooperative agreements — or grants requiring substantial involvement from USAID during implementation — continue to figure prominently in USAID’s grant-giving strategy. Eight out of the 20 organizations on this list of top USAID grant implementers recorded that 100 percent of their funding came from cooperative agreements, while for four others it surpassed 90 percent. Over the past five years, cooperative agreements accounted for an average of 51.73 percent of total USAID assistance. Click here to a view a larger version of the image. In April, USAID revised its guidelines pertaining to its acquisition and assistance protocols, causing some contractors to express concern over new policies that seem to favor grant spending over contracts. USAID officials assert that the changes were not meant to limit contracting opportunities. 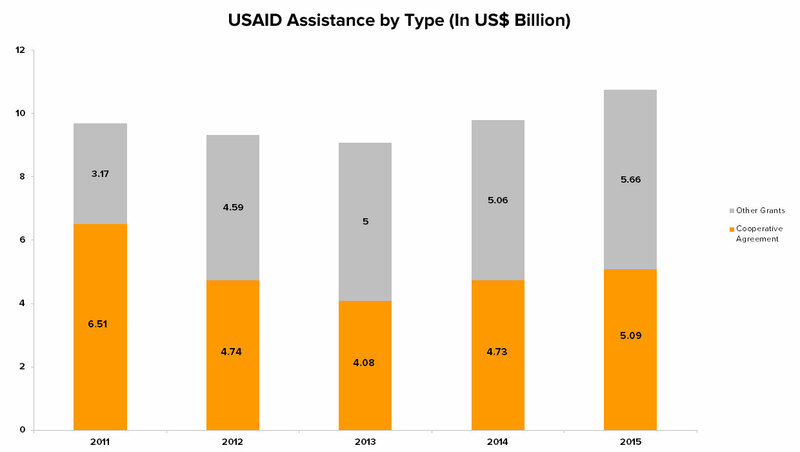 But if USAID’s contracting partners are correct, grant spending will increase further in 2016. Devex took a closer look at USAID financial obligation data to rank the top 20 grant implementers for the 2015 fiscal year, excluding multilateral organizations. Of the institutions listed below, nine also won contracts from USAID in the same year. Specializing in multiple areas of social development, FHI 360 provides a broad range of services including capacity development, training and technical assistance, research and analysis, quality control, monitoring and evaluation, marketing and communications, as well as behavioral change communication. 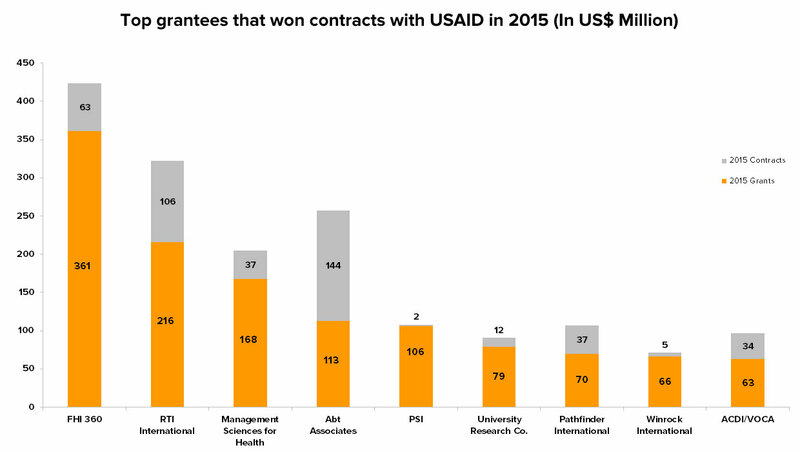 Apart from securing the most grant funding in 2015, FHI 360 was also among the top USAID contractors for the same year, garnering $63 million in contract funding. Jhpiego is a nonprofit health organization that works in areas of maternal and child health, HIV/AIDS, malaria, cervical cancer prevention and urban health. The institution is currently active in more than 40 countries working with health experts, governments and community leaders across Africa, Asia, Latin America and the Caribbean. An affiliate of Johns Hopkins University, Jhpiego helps provide much-needed healthcare services through research and capacity building, as well as by developing innovative solutions. As an independent, nonprofit research organization, RTI works with government institutions, businesses, universities, bilateral and multilateral banks, foundations and other nonprofit organizations to provide advisory and training services as well as program development services. Its areas of expertise include global health, education, governance, and workforce and economic development. RTI is one of the top USAID contractors, acquiring $106 million in contract financing in 2015. CRS works in as many as 100 countries with a formidable staff size reaching 5,000. Its core areas include emergency response and recovery, agriculture, health, education, microfinance, water and sanitation, justice and peacebuilding, and partnership and capacity strengthening. CRS is the official overseas aid and development agency of the United States Conference of Catholic Bishops. MSH focuses on strengthening health systems through advocacy, capacity development, health research, and by developing and scaling up affordable solutions for the most pressing health problems. The organization targets six health areas namely HIV/AIDS, tuberculosis, family planning and reproductive health, maternal, newborn and child health, malaria and other communicable diseases, and chronic diseases. MSH operates in more than 50 countries with a staff of more than 2,400 people. Save the Children USA works in areas of education, emergency response, health and nutrition, HIV/AIDS, food security and livelihoods, newborn and child survival, and child protection. It is one of 30 member organizations under Save the Children International – a global network active in as many as 120 countries. Other member organizations that received grant funding from USAID include Save the Children’s offices in Mexico ($2 million), Honduras ($1.16 million) and South Africa ($600,000). JSI Research and Training Institute works as the nonprofit arm of John Snow Inc. A public health research and consulting firm, its expertise cover a wide range of health issues including maternal, newborn and child health, HIV, non-communicable and infectious diseases, nutrition, immunization, and health systems strengthening. In 2015, John Snow Inc. garnered $10 million in grant funding and ranked as USAID’s third largest contractor winning $416 million in contracts. IRC is an international NGO that specializes in delivering supplies and expertise for emergencies and post-conflict situations. The institution works in more than 40 countries to provide rapid response and recovery efforts to the most pressing humanitarian crises. The organization’s main areas of intervention include health and sanitation, water, infrastructure, economic recovery, women and girls, children’s education and rehabilitation, and refugee resettlement and relocation. A leading institution for research and program implementation, Abt Associates specializes in a number of sectors including education, environment and climate change, food security and agriculture, health, community development, income security and workforce development. Apart from grant funding, the institution also won $144 million in contracts in 2015 ranking among the top ten USAID contractors for that year. Abt Associates works in nearly 50 countries and has a workforce exceeding 2,000 individuals. With a presence in 46 countries, Mercy Corps commands a team of 4,000 individuals and works in various sectors including agriculture and food, children and youth, women and gender, economic opportunity, education, emergency response, conflict management, disaster preparedness, environment, health innovations, and water.